Last weekend one of my closest friends from New Jersey came over and I wanted to treat her to a home-cooked meal. I was so busy preparing the main course that I had almost no time for dessert. My dear husband offered to pick something from the nearby store and I refused, because a dessert was taking shape in my head. 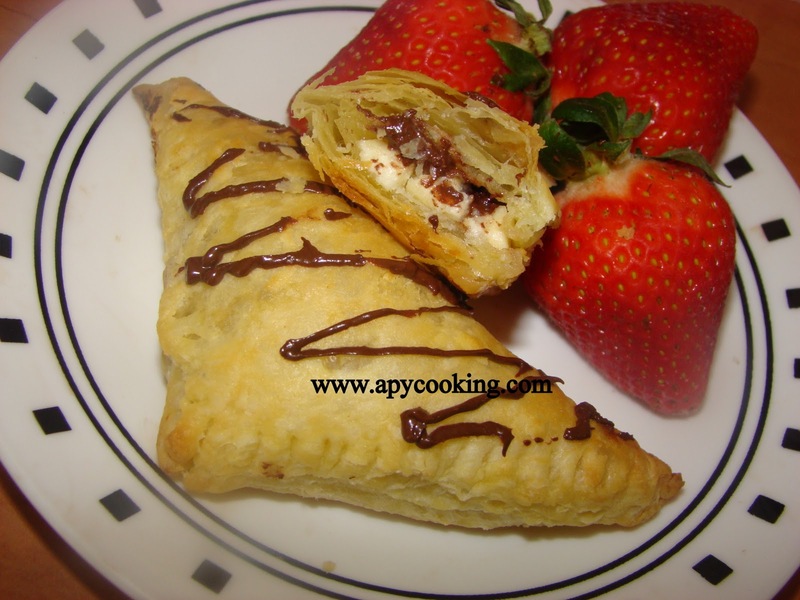 A couple of years back I had read about making chocolate turnovers with puff pastries. I always wanted to try it out. 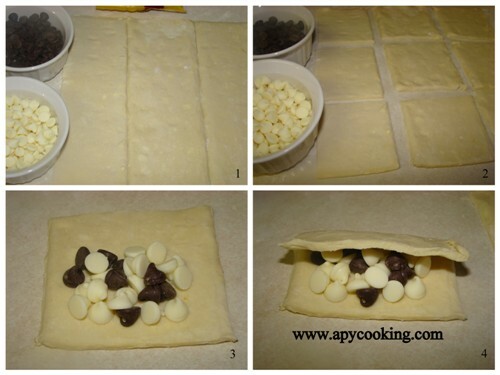 Luckily I had a pack of Pepperidge Farm puff pastry sheets in my freezer and some chocolate chips in the pantry. So I went ahead and put them together. 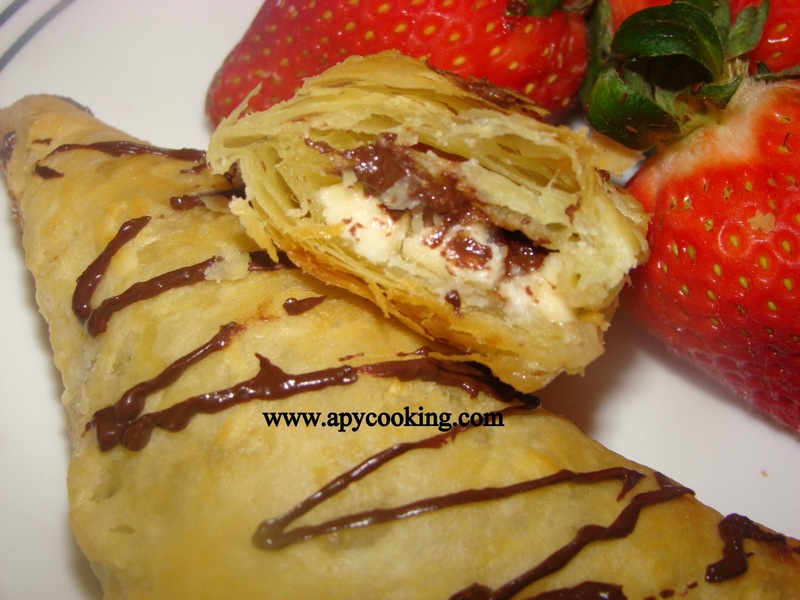 This is a very easy dessert and if you like puff pastries and chocolates, you should definitely try it. [I used white chocolate chips (because I love them) and semi-sweet chocolate chips. You can use just the semi-sweet chocolate chips, milk chocolate chips or even chopped chocolate]. 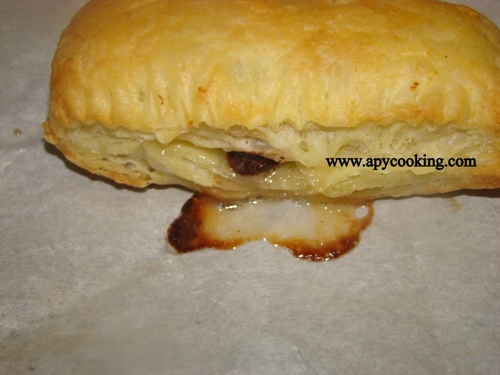 Thaw puff pastry according to package directions. [Usually room temperature for 40 minutes]. Preheat the oven to 400º F. Lightly flour a clean countertop. Spread the sheet on it. Cut the sheet into 9 squares. Press the edges with a fork [press hard and pull lightly], making sure you seal them well, otherwise the chocolate will ooze out. I tried a couple of different shapes. Line a cookie sheet (baking tray) with parchment paper. Place the turnovers 2 inch apart. Brush butter or egg wash generously on top. Bake for 18 minutes, till the turnovers turn golden brown. Looks like I missed a spot. See what I mean? Melt some chocolate and drizzle on top. Serve immediately. If you refrigerate the turnovers, the chocolate inside will harden. So microwave 15 to 20 seconds before serving. Also, I found the triangular shape the best, as the chocolate was evenly distributed. The white chocolate freak that I am, I loved this combination. And so did everyone else at home. Cheers to semi-homemade cooking! Wowwwwwwwwwwwwwwww.. Looks soooo tempting and inviting.. thanks for the recipe dear !! Very tempting and yummy !! Kya baat hai Aparna? Aur kya kya karoge? Bahut khoob soorat hai. Great idea! That was quick thinking! I have tried this before with plain chocolate and it when down perfectly. wow mouthwatering here,wonderful stuffing idea...cool. 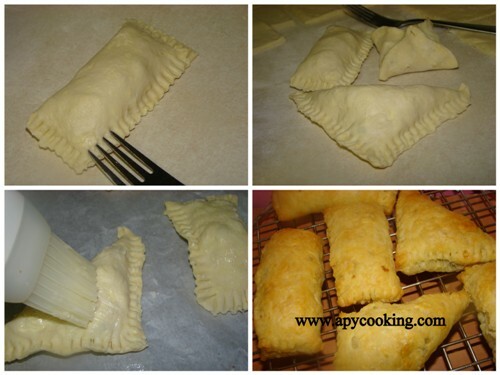 These look delicious and very easy! great idea of uing pastry sheets in a sweet stuffing. Simply delicious! Love the filling inside! Chocolates look wonderfully prepared. Marvelous recipe. This is definitely an easy dessert with less effort... Loving it already..